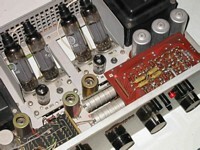 The VS70 or VS71 is maybe the best German Stereo amp made in the 60s (do not forget the Melpic 35). Frequency response and tech data is state of the art. Using the "Fernregler" connector the unit can be used as preamp or power amp without any modification. This amp uses 6 ECC83s in the preamp section and 2 ECF80s as drivers. 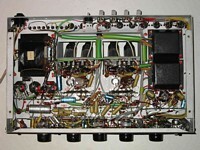 The output tubes are 4 EL36 tubes. It sounds very nice. The output transformer is grounded between the 0 and 4 Ohms tap - so be careful when switching or testing! The 71 was the successor to the VS70. The circuit received only minor changes, but among the years the EL36 were changed for EL500, then for EL504 and finally for EL5000s. Four of the ECC83s in the preamp section were changed for ECC808s. The later version offered two additional input level adjustment pots. Now there were six (!) pots to adjust bias, balance and hum balance of the output tubes and there drivers.